The Nationals ran into a buzz saw on Friday night, and it wasn’t the heat, nor was it the metro derailment, it was the right arm of rookie Drew Pomeranz, who absolutely dominated the hot Nationals offense through six and a third. With Colorado adopting a four-man rotation – and pitch limits of around 75 per outing – the Nationals only got to see Pomeranz through six and a third before he was yanked. Pomeranz hurled a one hitter through that short stint, and stymied pretty much everyone. His 81 pitches were located with pinpoint accuracy, out-dueling Stephen Strasburg. The Nats’ ace just couldn’t figure out Tyler Colvin, who went deep in the yard twice on his fastballs. Throughout Pomeranz’ portion of the game, the Nationals’ hitters were getting overly impatient and chasing out of the zone. Manager Davey Johnson said in the post game press conference, “Sometimes when you know what’s coming, you get overly aggressive.” Danny Espinosa had a rough night, going 0-4 with a pair of K’s, but he wasn’t alone, as Ian Desmond and Tyler Moore also went hitless in their plate appearances. Chasing out of the zone will do that to you. The Nationals wouldn’t make a dent in the Rockies until the 9th inning, when Ryan Zimmerman became the first runner past second on the night with a solo home run into the Red Porch. The Nationals would put a rally together thereafter, with a double off the wall for Michael Morse and a looping single by Adam LaRoche before the Rockies would send for Rafael Betancourt, their closer. Betancourt would retire three straight Nationals to end the game. 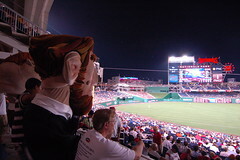 After the game, Davey Johnson, asked about Strasburg’s three straight losses, “He’ll be chomping at the bit to come back. He’ll be fine.” Davey also suggested that Strasburg to the end of the pitching rotation wasn’t yet a done deal, and would depend on the outcome of his appearance at the All-Star Game on Tuesday in Kansas City. The Nationals come back to play again tomorrow in the heat of the afternoon, with a 4:05pm start amid code red air quality and expected temperatures above the century mark. If you’re coming out, bring sunscreen and as many sealed water bottles as you can lay your hands on. Metro will be screwy, so plan on getting there early, and by other transit means.